In February 1864, in this vicinity, 22 white soldiers from the Kinston area were hanged in three groups by Confederate authorities. The executed men had been captured while serving in the Union army by troops under the command of Maj. General E. Pickett during operations around New Bern, N.C., and were deemed rightly or wrongly deserters from the Southern ranks. In February 1864, twenty two white men, who had deserted the Confederate Army and joined the Union Army, were captured by Confederate Forces under the command of General George Pickett at Beech Grove near New Bern. 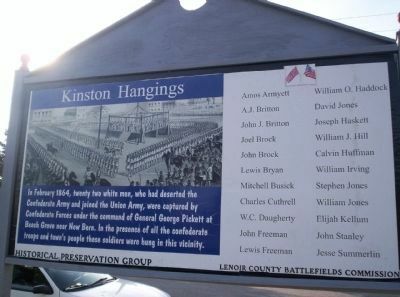 In the presence of all the confederate troops and the town's people these soldiers were hung in this vicinity. 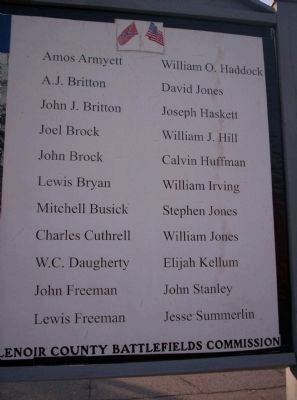 Group and Lenoir County Battlefields Commission, Written by Gerard A. Patterson. Location. 35° 15.574′ N, 77° 34.755′ W. Marker is in Kinston, North Carolina, in Lenoir County. Marker is on McLlewean Street. Touch for map. Marker is at or near this postal address: 175 McLlewean Street, Kinston NC 28501, United States of America. Touch for directions. Other nearby markers. At least 8 other markers are within walking distance of this marker. Harmony Hall (about 400 feet away, measured in a direct line); The Town Of Kingston (about 500 feet away); Lenoir County WW I and WW II Memorial (about 500 feet away); Caswell (about 500 feet away); CSS Neuse (about 600 feet away); Lewis School (about 700 feet away); CSS Neuse Confederate Ironclad Gunboat (approx. 0.2 miles away); Cat Hole (approx. 0.2 miles away). Touch for a list and map of all markers in Kinston. More. 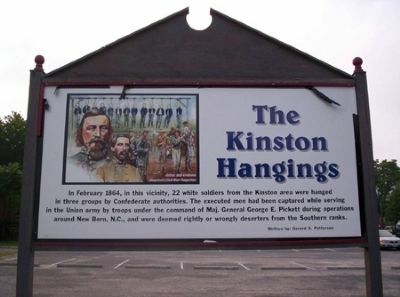 Search the internet for Kinston Hangings. Credits. This page was last revised on June 16, 2016. This page originally submitted on October 31, 2010, by Richard Phillips of Laurinburg, North Carolina. This page has been viewed 1,995 times since then and 19 times this year. Photos: 1. submitted on October 31, 2010, by Richard Phillips of Laurinburg, North Carolina. 2, 3. submitted on November 1, 2010, by Richard Phillips of Laurinburg, North Carolina. • Craig Swain was the editor who published this page.